Believe it or not, this is a Joe Friday review. 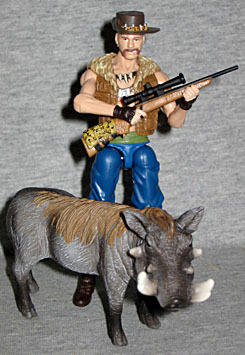 Remember in the Dreadnok battle set review, when we lamented the fact that Gnawgahyde couldn't come with a pet warthog, like the original toy did. We even made a Figuretoon about it. But these days, just because a toy doesn't come with an accessory you want, it doesn't mean you're out of luck. Schleich is a German company that makes PVC figurines - they started with Snoopy and the Smurfs, but these days they have lines based on dragons, elf-battles, the Wild West and, of course, animals. Zoo animals, farm animals, safari animals... all sorts of beasts, including an entire family of warthogs. To go with Gnawgahyde, I went with the male pig. A.k.a. the one looking to the right instead of the left. Yes, the pig and the sow are pretty hard to tell apart. She has tusks, too, so the only thing separating them is which way their head is turned, and a small size difference. He stands about 2" tall at the shoulder, while she's marginally smaller. The sculpt is very realistic. 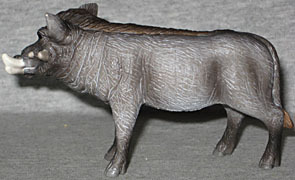 The warthog's skin has sculpted lines to suggest the fine hair covering his body, and there are thick wrinkles at the neck where he's turning his head to the side. The hooves are dark brown, fading quickly to grey near the knees. A white wash brings out the details of the fur, and the long hair on his back is light brown. Shadows have been airbrushed into the creases of his skin, his eyes are gloss black and his tusks fade from dark to light gray. Schleich figures aren't exactly cheap, but they are affordable. 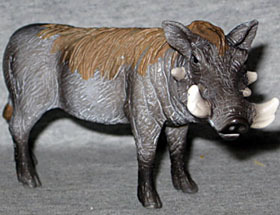 This warthog cost, like, four bucks, which is kind of a big bill when you're using it as an add-on to a $7 figure, but isn't a ton of money in the grand scheme of things. You can get Schleich figures at TRU, usually a couple aisles back from the Lego area, so it's not hard to get your hands on this little piggy if you want Gnawgahyde to have something to hunt. Or a friend to keep him company when he's out in the bush; we're not going to judge. This entry was posted in addendums, blog exclusive review and tagged GI Joe. Bookmark the permalink. great minds think alike, and this was my original idea to complete my very,very much beloved dreadnok 7 pack set..however, I couldnt get past the color and size differences fromthe original,so I got an original,only to be terribley disappointed my memory of being 12 and remembering it much cooler..so i found a happy medium and repainted it to match the original..then I got a whole bunch of them for all the Joe fans who feel the same insatiable need to complete gnaw "gahyde".. im not sure if im aloud this shamless plug,but for the hours of paintwork ive put into these,im not really making anything.. heres the link to my ebay sale on scale, properly painted gnawgahyde warthogs..honestly much better than the Schleich warthog version take it down if im breaking any rules, but take advantage of it if you want a really fresh one of a kind gi joe accessory.thanks guys and I live for your website. 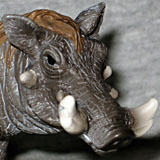 heres my sculpted and painted warthog.